We had some drizzle again during the night but the temperature was more moderate than in the past couple of weeks. Our campground last night was very nice. It was a small private campground and so quiet! We enjoyed it very much. Every evening when we pull into a campground someone asks us how we like our rig. They are mostly owners of the big 40′ rigs which get 5 mph. A lot of the folks have said they have researched our Winnebago and are thinking of downsizing due to cost of running their rig and ease of use of ours. 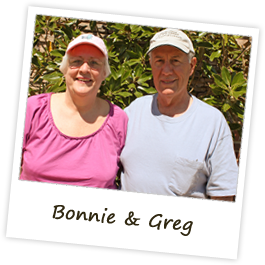 We definitely know we’ve made the right decision for our needs by buying the Winnebago View. We drove through the lower portion of Minnesota today and then into Forest City Iowa by 3:00 p.m. We arrived at the Winnebago Plant to check in for tomorrow’s appointment. 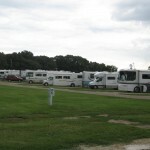 To our surprise, the parking lot was full of RV’s—all sizes. There are a few overnight sites near the service building with electric hookups for those waiting for service. Those spots were already taken, so we were sent across the road to the Winnebago Rally site. 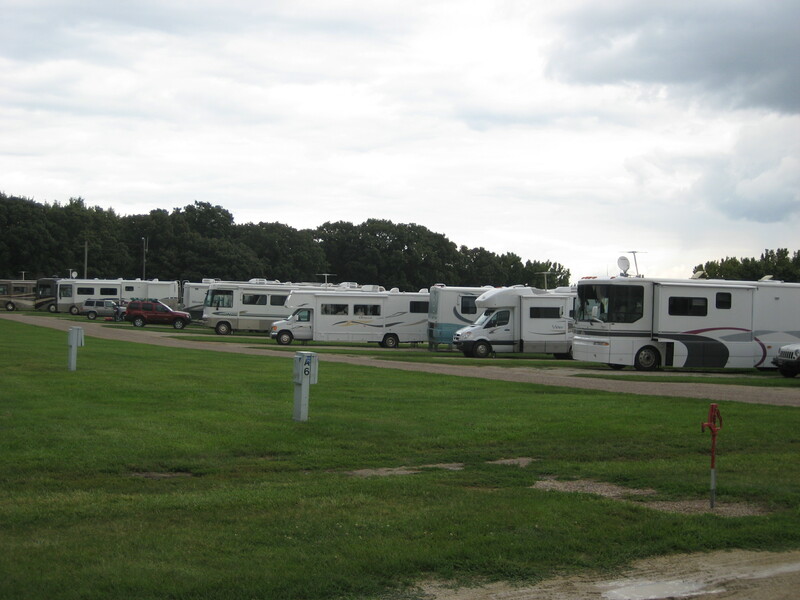 This is a field full of electric hookups (hundreds) that is used for the yearly Winnebago owners rally. There must be at least 15 of us over at the rally site, spending the night for an early morning appointment. We have to be at the gate at 7:00 a.m. in the morning to be processed in for the awning install. While they are working on our rig we will go through the visitor center and take the plant tour. Hope we will be on our way by mid-day. I bet we will not sleep a wink tonight!! !